Not always everthing goes as planned. That’s no problem as long as you are able to adapt yourself to the situation. 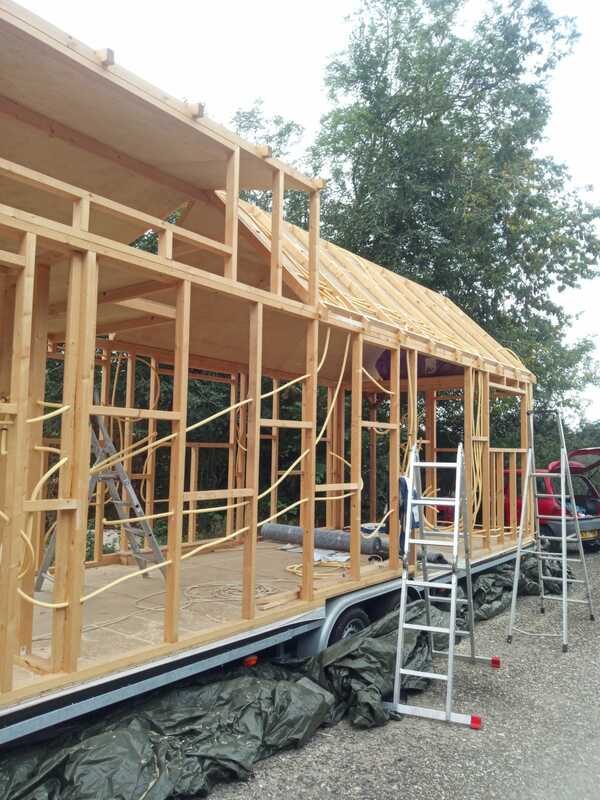 After all the walls were up and the bathroom wall and loft beams were installed, it was time to start constructing the roof of our tiny house. We started with the straight-up part of the dormers. Then the two of us managed to lift a heavy, eight-meter-long beam all the way to the top of our construction. How we managed that is still a mystery. This beam is meant to be the ridge of our roof. We placed it on the correct height using temporary support pillars. After that, we sawed a total of 30 roof trusses. Installing the rafters proofed to be a bigger challenge that we’d anticipated. 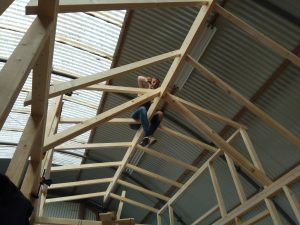 However, we managed while balancing on ladders and some beams. We’ve secured every single rafter using glue and screws. 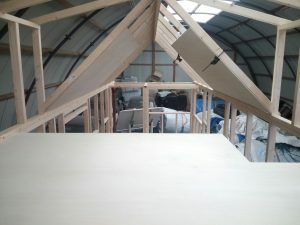 Our next tasks was to cover the inside of the roof with plywood. We used nine milimeter thick popler plywood. This proofed to be an even bigger challenge than installing the rafters. Fitting over and over again, taking another milimeter off, and another, and then suddenly we’d taken to much off. We also constantly had to work above our heads. Yes, this was the heaviest job so far. Slowly but steady we made progress, but it became clear to us that we wouldn’t be able to make everything waterthight before the end of summer. Besides, we were getting very tired because of working on the tiny house every day. Eventually, we were able to cover the entire inside of the roof before we had to go back to school. 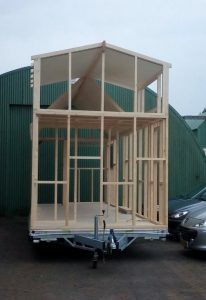 When the lectures started again, our tiny house was still in the shed, but it was too expensive to leave it there. So we found a caravan parking in the area that was high enough to stall our tiny house. The relocation was quite the adventure. Finding a suitable car and driver wasn’t easy. 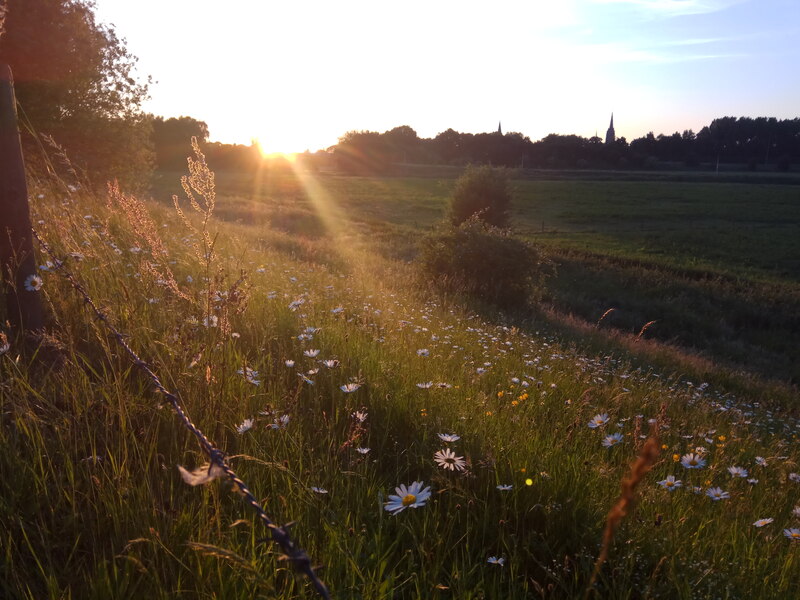 We didn’t dare to go on the highway, so we went very slowly using the roads with little trafic. It felt like such a relief when our tiny house was finally safe and sound and put away in the garage. Finally we had some time to rest… or so it seemed. We actually had to study. We went back to the garage to cover the tiny house with a huge sail to keep it clean. Now it still stands in this place. Our intention was to get back to work during the Christmas holidays. Unfortunately this wasn’t possible because we weren’t able to find a work place. We’ve decided to focus on completing our studies first, so after that we have all the time we need to finish our tiny house. 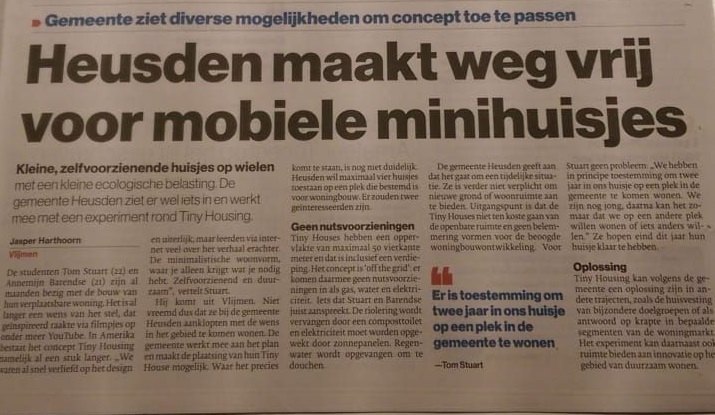 Het dak van ons Tiny House zit erop!